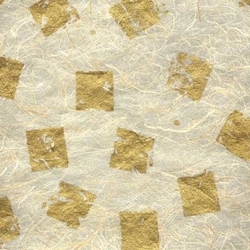 This abstract design features random metallic squares screenprinted with an aged gold-leaf appearance, over a cream colored abaca paper. A light weight of only 30 g/m2, this elegant paper is surprisingly strong due to the natural abaca fiber inclusions floating throughout. Terrific for scrapbooking, collage, fine art applications, mixed media, cards and custom invitations, book arts and more.